Raw food can be hit and miss (a mountain of zucchini 'pasta' comes to mind), but not at Nama. Try the 'No-meat feast' pizza (£14) with cultured cashew and chipotle cheese, semi dehydrated tomatoes, aubergine bacon, portobello sausage, crispy shallots and ketchup or the 'Full English' breakfast (£12), which includes cashew and coconut scrambled ‘eggs’ on artisan raw 'toast'. Whether seitan gives you a 'mud guts' or not, it's just the rules that vegans visiting London have to swing by here. A '2 piece' with chipotle mayo (£5) will be enough delicious regret for some. The 'Temple spicy burger' with crispy fillet, cheese, coleslaw, jalapeños with hot sauce and chipotle mayo (£6) is another option, however it's definitely not a 'neat eat' – keep the napkins handy. Tibits is changing the reputation of buffet restaurants, one piled up plate at a time. Stop by for a smorgasbord of fresh and interesting hot and cold vegan options to load onto your plate, which is then weighed and priced accordingly. Try a comforting hot lemon and ginger drink here too; especially useful if jet lag is still lurking. Note: There's another Tibits in Bankside behind the Tate Modern (124 Southwark Street SE1 0SW) and whole bunch of them in Switzerland too. 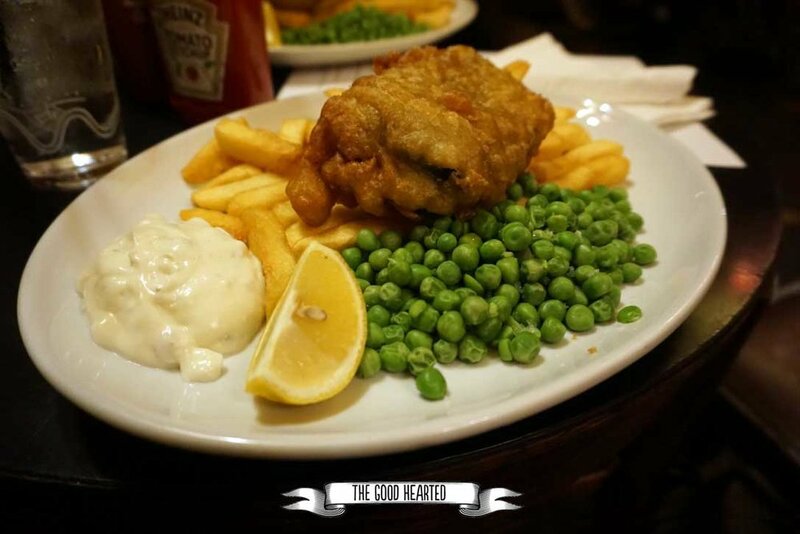 Proudly declaring themselves as London’s first Vegetarian and Vegan pub, their signature dish is 'Tofish and Chips' (£11.95) – tofu wrapped in seaweed, marinated in lemon and battered in vegan beer batter served with peas, chips and vegan tartar sauce. It's crispy and comforting but would be hard pressed to rival Melbourne's Cornish Arm's. Vegan shortcrust organic pie 'n' mash (£10) flavours are aplenty, with the 'mushroom & leek' (paracini mushrooms and chestnuts in a creamy sauce) sounding pretty damn tempting. Call ahead to make sure the kitchen is open: 020 7437 5920. We found Mondays to be unreliable so have not listed them open on that day. Tue-Sat: 12pm–3pm/5pm–10pm | Sun: 12pm–9pm. There's nothing more British than a spot of afternoon tea, and the vegan offering at La Suite West Hotel is commendable. You can expect delicious sandwiches graced with the likes of cashew cream cheese and bbq tempeh, along with warm homemade scones with strawberries and whipped coconut cream, cakes, fresh roasted Italian coffee and a selection of loose leaf tea. If you're staying here (they also do a vegan full english breakfast), take advantage of the opportunity to pre-book your afternoon tea and you'll save around £12 each. Planet Organic endeavours to supply the best and widest range of organic foods available, and there are plenty of vegan goodies in that mix (there is sooo much amazing chocolate). The hot food and salad bar is worth a visit for a quick and nutritious feed, where you'll find delicious curries, sides and soups – just check the labels for the cruelty free options labelled vegan. The Gate is an all vegetarian and vegan institution of sorts, that have been serving London for almost 3 decades. It’s a fine dining restaurant with accessible prices and unless you arrive early and eat quickly, you’ll definitely need to book a table. We tried the wild mushroom risotto cake with a creamy cep (mushroom) sauce, rocket & lemon truffle dressing ( £16) and shared the most amazing vegan Eton mess one could wish for (yep, I’m still dreaming about it). Note: Other UK locations are Leeds, Nottingham and Gatehead. There's also a whole bunch of them in the US as Mod was founded in Seattle.